MOSCOW, Russia -- Vladimir Putin has called Europe's bluff over east Ukraine as Russia-backed separatists seize a strategic town in defiance of a ceasefire brokered by France and Germany. The attack on Debaltseve by rebels loyal to the Russian president amounts to a test of the West's resolve to stand up to him - at the risk of an escalation of the conflict. Allowing the rebels to capture the rail hub without a strong response to what the West calls a clear violation of the peace deal agreed on Feb. 12 could look like appeasement of Putin. But declaring the agreement dead would be likely to force Europe to impose new economic sanctions on Russia and increase pressure on U.S. President Barack Obama to give Kiev lethal weapons, a move that might intensify the fighting. Putin's readiness to take big gambles, and to use the military option if necessary, puts him in the driving seat. "There is the notion that the West goes to the negotiating table and tries pivoting a little in one direction or the other, but the Russians are willing to completely flip the chessboard over," said Matthew Rojansky, a Russia expert at the Wilson Center think tank in Washington. German Chancellor Angela Merkel and French President Francois Hollande put their reputations on the line by brokering the peace deal reached at all-night talks in the Belarussian capital Minsk on Feb. 12. But despite watching while the rebels disavowed the ceasefire to advance on encircled Ukrainian troops, Berlin, Paris and Washington are not rushing into a response, wary of opening a dangerous new phase of a conflict that has killed more than 5,600 people in the last 10 months. European Union leaders have condemned Moscow and the rebels and threatened "appropriate action", but also said it is too soon to write off the peace deal. The United States is "gravely concerned" but wants to give diplomacy more time. The rebels announced hours after the ceasefire took effect that they did not believe it applied to the town of Debaltseve, their main military objective. Now that the town appears to have fallen, they might begin observing the truce. The West appears to be giving Putin the benefit of the doubt - hoping he will wind down fighting after the town is taken. The town, on a railway and road junction, links the two Russian-speaking regions of east Ukraine that the rebels hold and makes it far easier to defend their territory. There also appears to be hope in the West that Putin, who denies accusations by Kiev and the West that Russia has sent soldiers and weapons to help the separatists, has too much at stake to risk further escalation of the conflict. "To some extent Vladimir Putin has also put his reputation on the line," said Alexander Ivakhnik of Moscow's Centre of Political Technologies, suggesting Putin would face tough choices as events unfold and financial problems grow in Russia. "Russia has already lost hundreds of billions of dollars as a result of an intervention in the Donbass conflict that is obvious to the world. Can it afford to lose hundreds of billions more, given the growing risk of renewed military escalation?" Putin showed no sign of backing down over Ukraine on Tuesday evening, when he told Kiev's pro-Western leaders they should let their soldiers trapped in Debaltseve surrender to save their lives. He showed no sign of trying to persuade rebel leaders to halt the offensive on Debaltseve, and avoided criticising it. 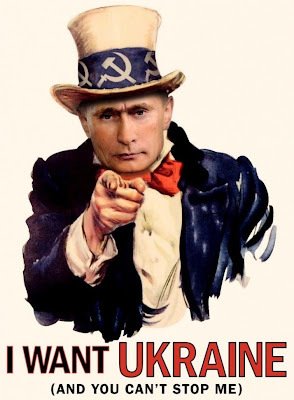 His ultimate goals remain unclear but he is widely believed to want to ensure Ukraine never joins NATO and that Moscow can maintain influence in eastern parts of the former Soviet republic indefinitely by sponsoring a "frozen conflict". Russia has deployed similar tactics, although on smaller scale, in Georgia and Moldova, where its troops have occupied and protected breakaway regions since the 1990s. But it is not clear that Putin has an exit strategy that would end his confrontation with the West. Any hint of a concession could be interpreted in Russia as weakness and damage his political standing at home, boosted by the seizure and annexation of Crimea from Ukraine almost a year ago. At peace talks in Minsk last week, Putin argued that Debaltseve was behind the frontline in east Ukraine - and therefore rebel territory - but Ukrainian President Petro Poroshenko did not accept this, diplomats said. In return for backing down on this point, Putin secured an agreement that the ceasefire should start 60 hours after the deal was reached rather than the 48 hours that had been planned, allowing the rebels an additional 12 hours to take Debaltseve. In the end, the rebels did not manage to capture the town before the ceasefire took effect. Instead, they declared that the truce did not apply to Debaltseve and launched an all-out assault. Putin appears to have gambled that the West would stand by. Western leaders' reaction seems to have been muted because they expected problems over Debaltseve. Moscow also won time by drafting a resolution adopted by the U.N. Security Council calling on all parties to stop fighting. "We believe the Minsk process is under strain, it has perhaps been damaged, but we still believe it makes sense to continue working," said Merkel's spokesman, Steffen Seibert, describing the U.N. statement as a step in the right direction. A big unknown in Putin's gamble is whether Obama decides to send Kiev lethal arms, a move Washington has been debating publicly for weeks. European countries say sending U.S. weapons would backfire by escalating the conflict without giving Kiev enough fire power to win it. But many in the United States, including senior figures in Obama's administration as well as some of its critics, say Putin needs to be forced to pay a higher price. Obama says he has not made up his mind. Republican Senators John McCain and Lindsey Graham evoked the appeasement of Hitler before World War Two, saying on Tuesday that Merkel and Hollande, with Obama's support, were "legitimising the dismemberment of a sovereign nation in Europe for the first time in seven decades". Referring to the debate over arms for Kiev, State Department spokeswoman Jen Psaki said "the same options that were on the table a week ago or two weeks ago remain on the table."